2nd time snorkeling with them. 2nd time snorkeling with them. Great service, reasonable prices, flexible itinerary. THE BEST SWIM OFF BEACH SNORKELING. Island Blue Hole Snorkel Adventure- Shamie is the BEST!! Went our on old boat. Didn&apos;t know we had to take a 20 minute bus ride to boat, but it was enjoyable. The weather conditions were not the best, however the tour company made every effort to ensure we had a memorable and value added excursion. They really went out of their way. The company was called Calabash Eco Adventures. My husband and son went snorkeling. The Excursion was the only part of the cruise the we enjoyed. The reef was incredible...loved the turquoise waters and our Guide "Ricky" gave a great review of the history of the Bahamas and kept things very entertaining for all of the members on our excursion. Second time on this same excursion so I know how great it can be. We originally signed up for the Sail and Snorkel trip. 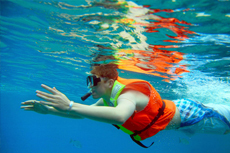 Booked independently with Seahorse Sail and Snorkel. A great 3-hour snorkel trip with Pat and Diane&apos;s Excursions.